Twelve authors coming together and providing short stories for an anthology. Twelve short stories of empowered women overcoming obstacles and finding success and love. 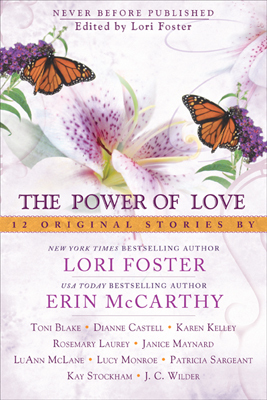 The Power of Love is an anthology of twelve romances written by some of today's brightest stars in the romance genre showing that sometimes anything is possible, given the power of love. Time had run out and Jason Ratcliff was leaving. Felicity Jones had loved him since she had been a teen, and he was the older brother of her best friend. A big brother who had put his dreams of college on hold in order to run the farm and raise his younger sisters after their parents' deaths. Now was the last chance Felicity had to tell Jason the truth of her feelings. Her own parents had moved south, and they would be selling their farm as well. If she didn't act soon, there would be no opportunity for them. The Girl Next Door is my favorite story in this anthology. I simply loved the gentle love story between the hero and his heroine, who just happened to be the girl next door. They were both at a crossroads in their lives, but knew that ultimately, whichever road they chose to follow, they would choose the same. Although not a "best friends" romance - which I adore - it is a "best friend's" brother story, and just as satisfying. Included in The Power of Love are: Sweet Dreams by Lori Foster, Unpredictable by Erin McCarthy, After Hours by Toni Blake, Last of the Red-Hot Mammas by Dianne Castell, Salesman of the Year by Karen Kelley, Dance the Fandango by Rosemary Laurey, The Girl Next Door by Janice Maynard, Chicken Soup for Annie by LuAnn McLane, No Angel by Lucy Monroe, Angel in the Alley by Patricia Sargeant, Hannah's Choice by Kay Stockham and The Mouse Who Roared by J. C. Wilder.